Caption slip reads: "Photographer: Don Sandusky. Date: 1958-09-01. Assignment: Traffic accident, motorcyclist hits WLA couple. 10, 42, 38, 11, 12: Neg. 28: Colin Turner, 17, 913 Wilshire Blvd., Santa Monica, motorcyclist, comforted by Mrs. Paul J. Anderson (Marian) following accident. 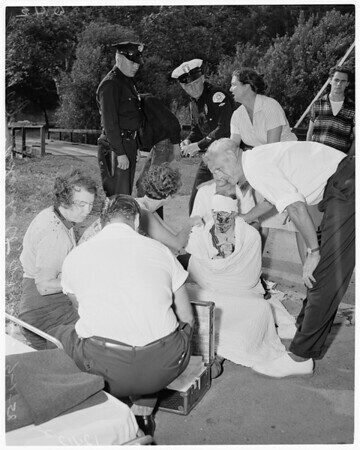 Other pix [sic] show ambulance attendant giving aid to victims W.R.B. (c.q.) Osterholt, 63, retired Santa Monica City College teacher, 700 San Lorenzo Dr., West Los Angeles. Also pix [sic] of attendant giving aid to Osterholt's wife Mrs. Virga (cq) Osterholt. All victims taken to Santa Monica Receiving Hospital. Accident occured in front of 558 East Channel Road, WLA. Turner said he was making a turn when the throttle of the motorcycle stuck. He yelled to couple but was unable to avoid them. He ran over Osterholt and was thrown to pavement, suffering chest and right elbow injuries."